The following is true regardless of genre: Your story should have high stakes and lots of tension/conflict. But exactly how you cash this out in a murder mystery presents it’s own unique challenges. The stakes need to be high for both the detective and the murderer; they must both stand to either gain and lose a lot. The same with the murderer. Let’s cash this out. First, there’s the obvious: The detective’s goal is to identify the murderer just as the murderer’s goal is to evade detection. Notice that if the detective achieves his goal the murderer can’t and vice versa. That’s the structure we’re looking for. If the detective succeeds the murderer will, at the very least, go to jail. If the detective fails, his reputation will be in tatters, perhaps he’ll even lose his job. But there are less obvious stakes. The detective might own his own business and solve puzzles on the side. Perhaps he has developed a reputation for solving murders that stump the police. How would his business fare if his customers came to see him as incompetent? Or it could be that some suspicion has been cast on the detective. He must solve the crime to clear his name. If, for instance, the detective owned a bakery and the victim was killed with poison, that would NOT be good for business! Or it could be that the detective is a lawyer. He needs to exonerate his client (who happens to be his aunt’s favorite nephew) and the only way to do that is by identifying the real murderer. If he fails Aunt Petunia will hate him forever and he’ll lose most of his clients! Again, there’s the obvious: The murderer’s goal is to evade detection, to commit, as the saying goes, the perfect murder. If he fails, then he could be killed or spend the rest of his life in prison. But there are less obvious stakes. Even if the murderer is never sent to prison he could lose everyone and everything he cares about: his job, his wife, his kids, his espresso maker, not to mention the cute Pomeranian that licks his toes in the morning. Life, as he knows it, would be over. It’s important to mention the stakes for both the protagonist and antagonist at the pinch points, to remind the reader of what the detective is up against, how desperate the murderer is, the lengths to which she will go. As we have seen, the detective has a goal as does the murderer. The detective wants to identify the murderer by way of investigating clues. The murderer wants to remain free! High stakes help CREATE high tension. How? High stakes drive characters to do things that take them out—way out!—of their comfort range. It is the push and pull between characters, especially between antagonist and protagonist, that drives a story forward. Every scene, no matter who is in it, has two important characters. These characters are working toward different clearly defined goals that are mutually exclusive. If one character achieves his goal then the other character cannot and vice versa. Sometimes these two characters will be the protagonist and antagonist (or, in our case, the detective and murderer), but not always. In fact, in a murder mystery, a reader won’t be able to tell whether the person in the scene with the detective is the murderer! In that respect, murder mysteries really are quite different from other genres: readers don’t even know who the antagonist is until the very end! Clear as mud? Let me give you an example. Let’s say our detective wants to get a witness, Mrs. Lawson, to tell him what she saw the night of the murder. The main character in the scene is the detective and the character opposing him is Mrs. Lawson. The detective has to find out WHY Mrs. Lawson doesn’t want to tell him what she saw—is she afraid or is she covering for someone she knows?—and convince her to do something she doesn’t want to do. If he does, he achieves his goal. If not, he loses. Is Mrs. Lawson the murderer? Probably not but who knows. In an Agatha Christie murder mystery the less suspicious someone is the greater the likelihood they’re the murderer! It is the reader’s knowledge of what the main characters in any specific scene have to gain and lose that pulls the reader through it. Will the detective (or perhaps the detective’s helper) get the clue they need to solve the next part of the case, the next piece of the puzzle? Ultimately, they will have to face their darkest fears to achieve their goals. 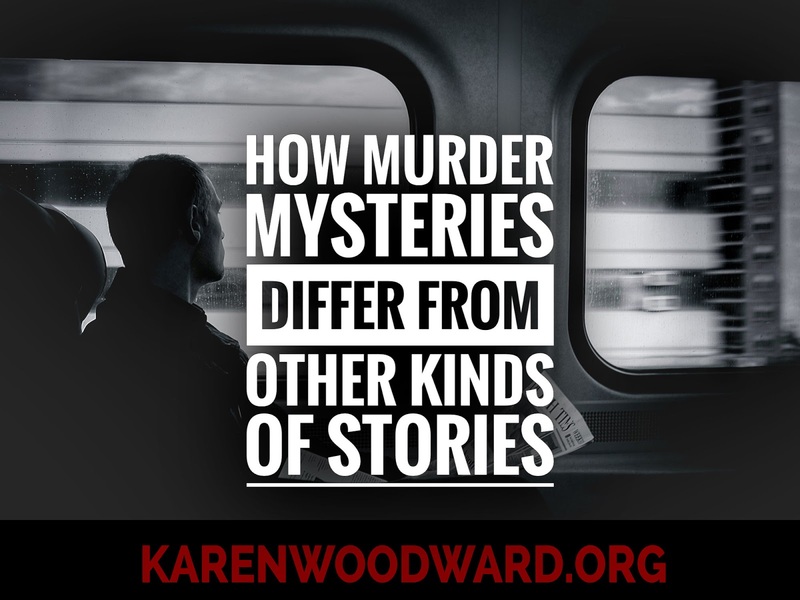 One thing that’s different about mystery stories in general (I’m including thrillers in this category) is that the protagonist—and usually the reader—doesn’t know who the murderer is. Perhaps we have a smattering of scenes where we see the murderer anonymously do a number of bad things, or plan to do a number of bad things, but we don’t know who this person is until the end. So the antagonists we have are going to be the cranky boss, the obnoxious co-worker, even the weather! For example, the detective and his sidekick must visit someone who is in the hospital, scheduled to have a risky operation, and they need to question her. But there’s a storm brewing. Then it breaks, turns the roads to mud and the sleuth’s car gets stuck. And so on. Each scene must have something who ACTS as an antagonist, something that opposes the goal of the main character in that scene. The antagonist doesn’t have to be a person though. In this example it was the storm. More broadly, the antagonist can be a person, place, thing, idea—it can be the main character themselves! I don’t know about you but I’ve sabotaged myself a time or three. I've received some wonderful feedback regarding the detective's stakes. Adaddinsane mentioned that in many excellent murder mysteries the stakes for the detective are low. For instance, this is true in many of Agatha Christie's mysteries and she is one of the best selling novelists of all time! I've noticed this tendency toward low stakes as well and wrestled with it. Personally (and this could just be my own preference) I like it when the sleuth has something personal riding on the outcome. It could be something humorous (an ill-advised bet he's made) or it could be something more substantial (the failure of his business). I find this adds more conflict, more tension, and helps pull me through the book. K.M. Idamari (over on Google+) mentioned that Murder Mysteries have a social dimension. The murder breaks the rules of society. Identifying the murderer is about writing a wrong, it's about justice. Very true! Yes, this is something I meant to speak about then it slipped my mind. Thank you!! An Autobiography, by Agatha Christie. Read about Agatha Christie's life in her own words. From an Amazon reviewer: "Agatha Christie's autobiography will keep the reader interested in knowing a little bit more about her life as wife, mother, and author." 1. I say “characters” but these needn’t be people. For instance, a tornado could be an antagonist. However in the case of a murder mystery the antagonist does have to be an agent since they have to try and avoid detection. I'm not sure you can say that murder mysteries must have high stakes for the detective. I know we're not all Agatha Christie - but Miss Marple would lose nothing if she failed to discover the murderer, after all most people don't take her seriously anyway. Yes, other people might die but the sleuth is largely unaffected by success or failure. In my early Maliha Anderson stories the only stakes for her are that *she* wants to know because of her sense of justice. Nobody else is interested or cares (particularly not about what some upstart halfbreed thinks). Thrillers are a completely different matter since they almost always involve the threat of death to the protagonist. Excellent point! Yes, Agatha Christie generally didn't include high stakes for her sleuths. I remember watching a wonderful adaptation of Murder on the Links (starring David Suchet as Poirot) where Poirot made a bet with Monsieur Giraud. If Poirot solved the case Giraud would give up his signature pipe but if Giraud won, Poirot would have to shave his signature mustache! Of course the screenwriters played it for comedy. I don't believe that wager was in the original tale, but I thought it worked wonderfully! Even though it was played for comedy, it added another dimension. It is very true that not all murder mysteries have high stakes for the sleuth, but I think it works better if the sleuth has SOMETHING personal at stake, something that means a great deal to them if not to anyone else. Thank you for the comment. This is something I've thought a lot about over the past few years. I don't disagree that it might be better, just saying it's not a requirement.